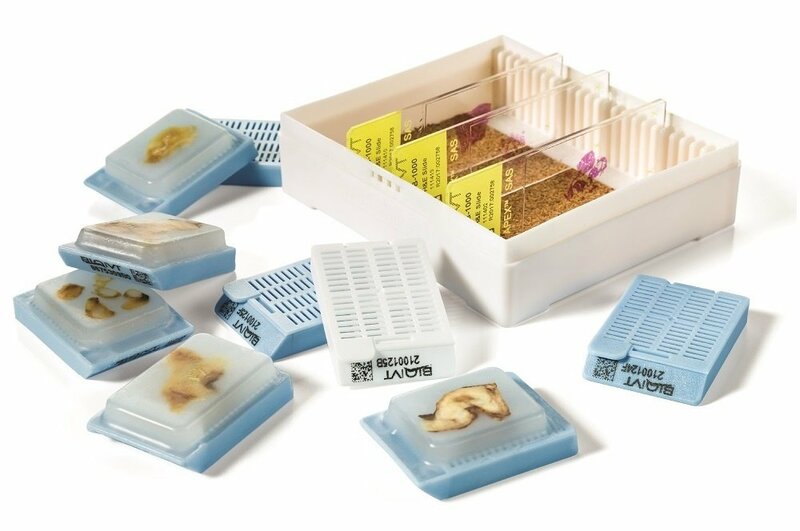 Biospecimens are commonly used in research, from the bench through to late phase clinical trials. Understanding how pre-analytical deviations in collection, processing, and storage are critical to downstream applications and data analysis. In this post, our Director of Product Marketing for Disease State Products, Cathie Miller, Ph.D., interviewed Jason Adams, BS HTL (ASCP), BioIVT’s lead histologist to better understand how processing occurs and how it can affect the specimens. CM: What are the main types of fixation that are used by researchers today? JA: Formalin fixation followed by paraffin embedding (called FFPE) or snap-frozen in liquid nitrogen (generally referred to as Fresh Frozen or FF) are the two main formats our clients’ request. We do see some demand for fixation in other reagents than formalin or to embed frozen specimens in OCT, a standard freezing media – but these are generally project specific. One of more frequent special request is for the use of RNA stabilization reagents, such as QIAGEN’s RNAlater®. Specifically designed for use with tissues and cells, RNAlater rapidly permeates tissue, stabilizing and protecting cellular RNA for downstream gene expression analysis. CM: Once a specimen is fixed a certain way, can it then be fixed in a different manner? Can you go from Fresh Frozen to FFPE? What about Fresh Frozen to OCT Embedded? JA: You can take a fresh frozen sample and embed it in OCT. This allows the sample to be sectioned on a cryostat better, creating better slides for downstream staining applications. However, taking a sample that has been Fresh Frozen and converting it to FFPE does not result in an optimal tissue block. Basically, in the process of snap-freezing a specimen, the water in the specimen turns to ice. This causes “freezing artifact” and in general is detrimental to tissue morphology. CM: You say that freezing artifact is detrimental to tissue morphology. Do you then suggest that if researchers want to look at tissue morphology through either immunohistochemistry or cytochemistry/special stains, they use mostly FFPE fixed sections instead of Fresh Frozen? When would someone use Fresh Frozen instead of FFPE fixed sections? JA: Not necessarily. There are times where researchers have to use FF sections. In those cases, we try and limit the freeze artifact by using special reagents and tools. These are generally more labor-intensive and thus only used when necessary. Also, certain tissue types that are higher in water content have worse freeze artifact effects, such as brain, lymph node, fatty tissue or tissue where there is a lot of blood present. CM: Are there other factors that are important to the fixation process? JA: One of the key factors is the size of the tissue section. With both FFPE and FF procedures, there is a diffusion rate (of either the formalin perfusion of the tissue or the freezing process through the tissue) that limits the size of the tissue for best results. Generally, for both FFPE and FF procedures, we state that 3mm is as thick as you want tissue to be. Surface area is not as important, because you are getting diffusion through the cross-section of the tissue. CM: Do you process samples differently based on their size? JA: Yes, a smaller tissue is not processed as long. But we also take into account the type of tissue it is and adjust based on bone and fat content, etc. CM: If the tissues are less then 3mm thick, can they easily be stored in vials or tubes? JA: They can be, but we don’t suggest it, especially if you want to preform staining on sections for downstream analysis. First, if you are storing in a vial or tube, ensure that you are using a certified cryogenic vial, not an Eppendorf tube or other type of vial not specifically created for cryogenic storage. However, we don’t generally store our tissues, whether FFPE or FF in vials, we store them in histology cassettes. CM: What are the benefits from storing the tissue in cassettes? JA: Many, most relating to damage to the tissue in either placing the tissue in the vial or removing the tissue from the vial. Frequently, the vials are not quite the right size to fit the tissue. Thus, objects are used to push and mash the tissue into the vial, cause deformation and preventing downstream histological visibility of the tissue layers and morphology. This is especially important to tissues like skin, intestine, and endometrium. Secondly, this mechanical manipulation also causes activation of stress genes, altering downstream analysis of gene expression. Careful placement of the tissue in a cassette allows for decreased variation and extra artifact in the tissues. Finally, it can be difficult to remove the tissue from the vial. At times the vial needs to be cut or crushed in order to remove the tissue. This again results in damage to that tissue, resulting in fragmentation or even destruction of the tissue block. CM: How do you section tissues that are only fresh frozen, not embedded in OCT? JA: That is an excellent question. OCT can interfere with some downstream processing, so we as a matter of choice do not embed our tissues in OCT. If we need to section a block that is not OCT-embedded, we will use DEPC-treated RNA-free water. A drop of this water is used to adhere the tissue section directly to the chuck, which then allows us to create sections from the tissue. CM: Why do you use DEPC-treated water and does the DEPC interfere in downstream analysis? JA: DEPC is used to create RNase free water, thus providing a solution that limits any effect on downstream analysis. The water is autoclaved after DEPC treatment, which inactivates the DEPC by causing hydrolysis of diethylopyrocarbonate. This results in the release of CO2 and EtOH. Thus, based on a half-life of 30 minutes, if we autoclave 1 liter of DEPC-treated water for 15 minutes – the water can be considered DEPC-free. However, because we understand the importance for researchers in knowing all pre-analytical variations, we always check to make sure that we ask our clients if DEPC-treated water is ok when they select a specimen that has been exposed. CGM: Thank you, Jason, this has been truly informative. JA: You’re very welcome. If clients have additional questions or concerns or want to discuss a specific custom project, we have a whole team of pathologists, histologists, and molecular biologists to talk with them and design a custom project. Learn more about BioIVT's quality assurance and certifications here. If you have a specific question, please feel free to contact our technical experts.